The Marine Stewardship Council (MSC) has established a program whereby a fishery may be certified as being sustainable. The sustainability of a fishery is defined by MSC criteria embodied in three Principles: relating to the status of the stock (Principle 1), the ecosystem of which the stock is a member (Principle 2), and the fishery management system (Principle 3). Since many of these MSC criteria are comparable for global tuna stocks, the MSC scoring system was used to evaluate 19 stocks of tropical and temperate tunas throughout the world (based on Principle 1) and also to evaluate the management systems of the Regional Fisheries Management Organizations (RFMOs) associated with these stocks (based on Principle 3). 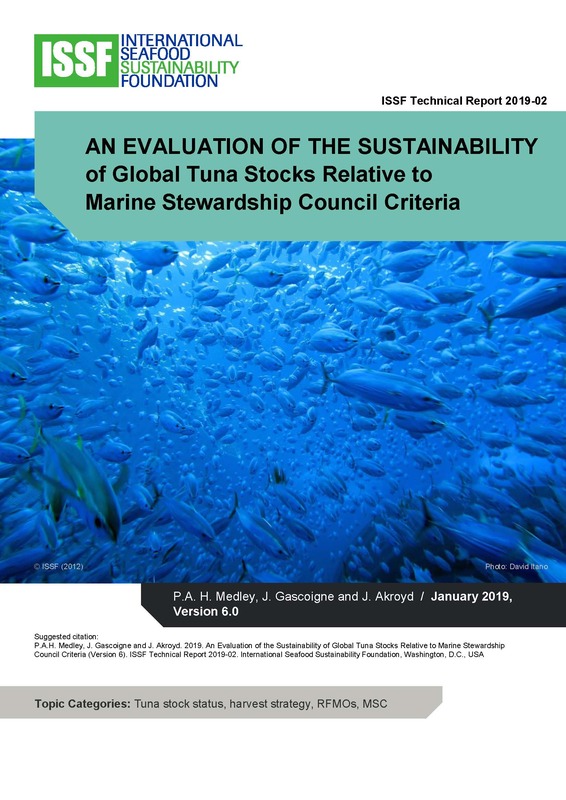 This January 2019 report with P1 and P3 scores, “An Evaluation of the Sustainability of Global Tuna Stocks Relative to Marine Stewardship Council Criteria,” is authored by P. A. H. Medley, J. Gascoigne, and J. Akroyd. It does not evaluate fishery-specific ecosystem criteria (P2).